Basic Books/HarperCollins, 1997, out of print; Kindle ebook, $6.99; Nook ebook, $6.99. Other ebook formats are on the way. Henry Kisor didn’t realize what he was getting himself into when a friend invited him aboard his small plane one afternoon, but as the engine revved and the craft took flight, he found himself exhilarated as never before. Fifty-three years old, Kisor had looked into a mirror and saw staring back ”a man who was short, fat, bald, bespectacled, and deaf.” He needed to reclaim his zest for life, and he found the answer in learning how to fly. Kisor’s dream begins to take shape when he learns that radio communications are not required in most of America’s airspace, and that ”visual flight rules” are the same for hearing and deaf pilots alike. With the eagerness of newfound youth, he throws himself into his lessons and plans a suitable maiden voyage: a reenactment of Cal Rodgers’s 1911 journey from New York to Los Angeles, the first coast-to-coast flight. Along the way, Kisor learns that Rodgers himself suffered from severe hearing loss, which adds an unexpected personal connection to the enterprise. 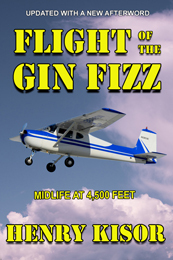 Soon after getting his license, Kisor falls in love with a thirty-six-year-old beauty: a classic Cessna two-seater that he buys and renames Gin Fizz, in honor of Rodgers’s Vin Fiz (itself named after a popular soft drink of the day). He then plans out his trip and invites the reader into the cockpit as he takes to the air, dodging storms and greasing landings on a journey across America that recalls the derring-do of the early days of aviation. Landing sixty-five times along a route that takes him from New York to Chicago to Texas to California, Kisor introduces us to the men and women who make up the ”brotherhood of aviation”—those who staff the airports, repair the planes, teach student pilots, ferry skydivers (and sometimes jump themselves), and perform aerobatic stunts —and who open a window onto a rich and charming side of American life and lore. But Flight of the Gin Fizz is an internal journey, too, as Kisor slowly shakes off the midlife blues that had led him to the Cessna’s left seat in the first place. As he proceeds west toward his goal, Kisor learns how to push the envelope of his own capacities, reaching new levels of proficiency and self-reliance, and stretching the limits of his familiar landbound life. For pilots, passengers, and armchair travelers of all stripes, Kisor offers an unforgettable voyage of self discovery and high adventure—and a new appreciation of life’s possibilities.